Sweet, creamy and delicious this orange fruit dip recipe is so easy and made with only 3 ingredients! This makes such a fun dessert during the Summer months and is always a hit when served at parties, something you’ve got to try! Normally I do not go for rich and sweet – give me something salty. Of course, there is always an exception and this Orange Fruit Dip recipe is one of them. I am not one to serve dips often but this one made with homemade sweetened condensed milk is delicious! The one special occasion on which I use the Orange Fruit Dip and, would get into trouble if I didn’t, is the celebration of sixteenth birthdays! There would be some disappointed folks around here if it were not served. For our children’s 16th birthday parties, I began the tradition of a luau. It is a tradition that caught on and is looked forward to by all! In fact, I think it is the favorite birthday! 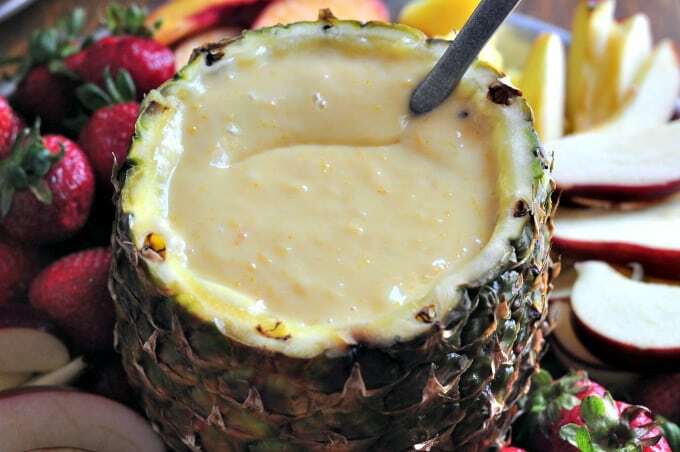 One of the highlights of the party besides leis and grass skirts, is a fresh fruit tray (or trays as it is now since the family has expanded) centered around a pineapple shell filled with this Orange Fruit Dip Recipe. Orange Fruit Dip is very rich and really enhances the flavors of the fruit! What Fruit Can I Serve With This Orange Fruit Dip Recipe? 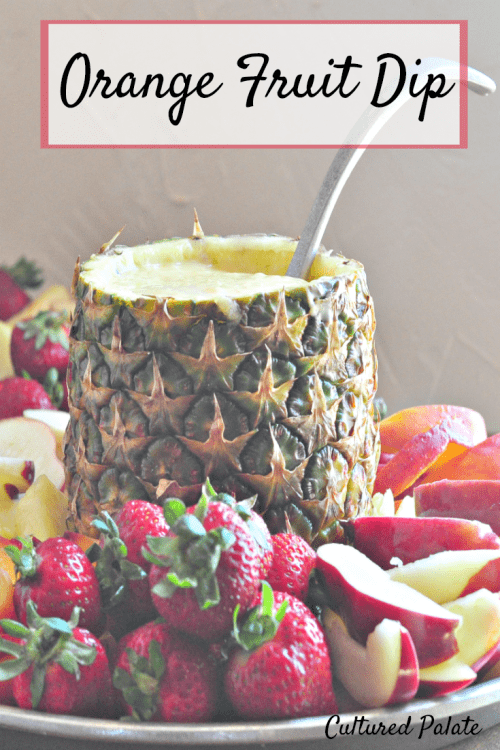 It’s so fun to do especially when the piece of fruit falls into the dip and must be fished out, carrying extra dip with it – a spoon works very well for this! 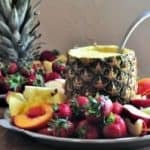 Whether you are serving young or old, a bowl (or pineapple full) of this Orange Fruit Dip Recipe surrounded by colorful fresh fruit makes a statement – and, it is so easy! Before beginning the GAPS diet, I used store-bought, canned, sweetened condensed milk to make Orange Fruit Dip and it is thick and creamy. Now, however, in an effort to convert recipes to healthier versions without sacrificing taste, I use homemade sweetened condensed milk which can be sweetened with honey, Sucanat or raw sugar. The resulting taste is every bit as yummy! To make the pineapple shell, I start with a fresh pineapple and cut off the top. Be sure to save it for decoration – I use it as the center of a second fruit tray. While you can use a tool like this one, available from my affiliate, pineapple de-corer, I use a long sharp knife. Begin by cutting around the edge of the pineapple leaving a 1/2 inch of the shell intact. After I have cut around the edge, I cut a grid in the core of the pineapple down through the meat. Finally, holding the knife at a diagonal, I slice and pull the chunks of pineapple out leaving the shell intact and ready to be filled with Orange Fruit Dip. 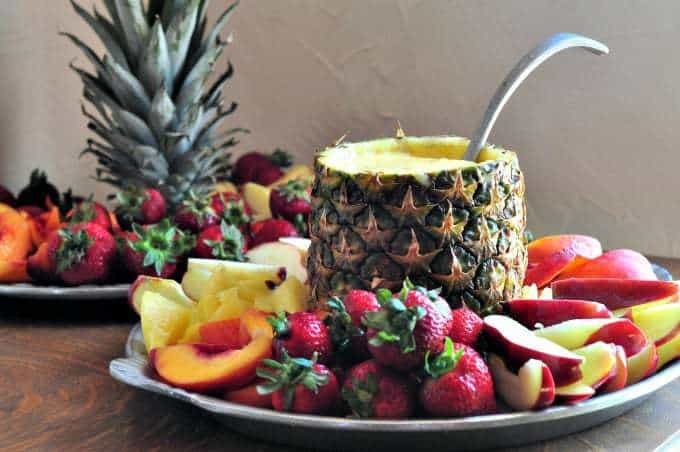 Wrap the pineapple shell and top in saran wrap and refrigerate until ready to assemble the fruit tray. You can see in the following photo Orange Fruit Dip made with canned sweetened condensed milk. Notice the slightly darker color in this photo made with homemade sweetened condensed milk, sweetened with honey – still absolutely delicious but a bit darker and not so thick. If you’ve tried this orange fruit dip recipe or any other recipe on Cultured Palate please take a minute to rate the recipe and leave a comment letting me know how you liked it. I love hearing from you! You can also FOLLOW ME on PINTEREST, FACEBOOK, INSTAGRAM, YouTube and TWITTER. A perfect bright summer treat for potlucks and gatherings. Combine all ingredients in a small bowl. On a serving platter place the pineapple shell in the center. 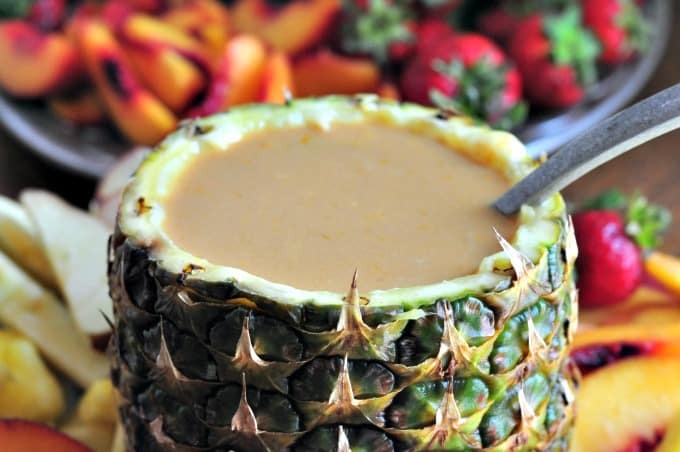 Fill the pineapple shell with Orange Fruit Dip. 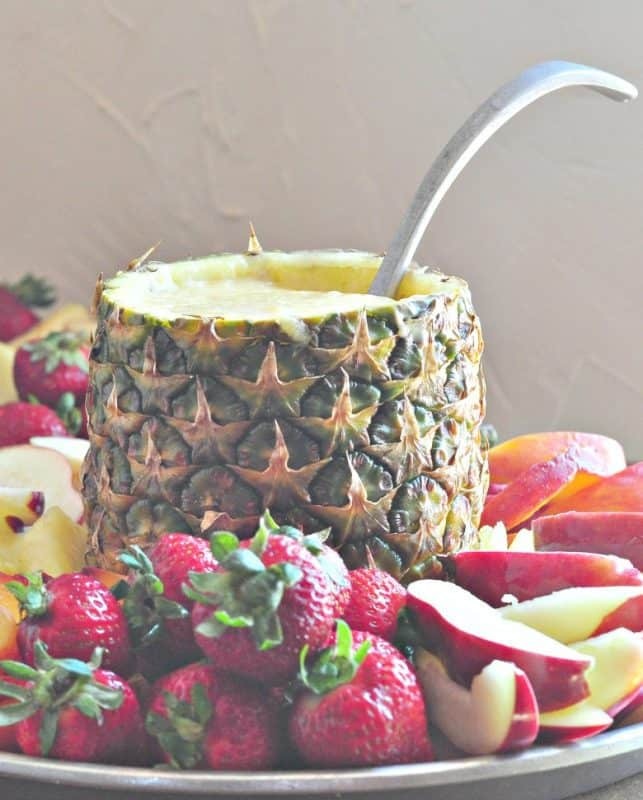 Arrange fresh fruit around the pineapple shell. Don't forget the party toothpicks - the kind with the colorful frills on the end - children (and adults) love them! If using homemade sweetened condensed milk made with honey, the fruit dip will not be as thick but it tastes delicious! To make the pineapple shell, I start with a fresh pineapple and cut off the top. Be sure to save it for decoration - I use it as the center of a second fruit tray. Oh, is my mouth ever watering!! We have 4 years before our oldest reaches 16. I wonder if I could talk her into it sooner? Or maybe we should just do it for New Year’s? Either way it could be a new tradition on a yearly basis because this looks YUMMY! This sounds awesome. 🙂 And thanks for the link to homemade sweetened condensed milk! I just happened to need that for a new recipe at home. Can’t wait to try out the fruit dip! P.S. The first link to milk is faulty, just a heads up. Why have I never heard of a dip like this, it looks amazing! Can’t wait to try it. Emily, it is amazing to be so easy – enjoy!